The DreamLine Aqua Ultra is frameless shower or tub screen with European appeal and modern architectural design. With a stunning curved silhouette that creates an open, inviting feel, the Aqua Ultra will transform your bathroom with elegant style to match its functionality. Configuration consists of Stationary Panel and Swing Door. Reversible for a right or left wall installation to fit your specific layout with a convenient towel bar handle. The DreamLine Flex pivot shower door and SlimLine base kit offers modern appeal at a budget friendly price point. The versatile Flex model combines cutting-edge pivot hardware, simple installation and dependable performance. 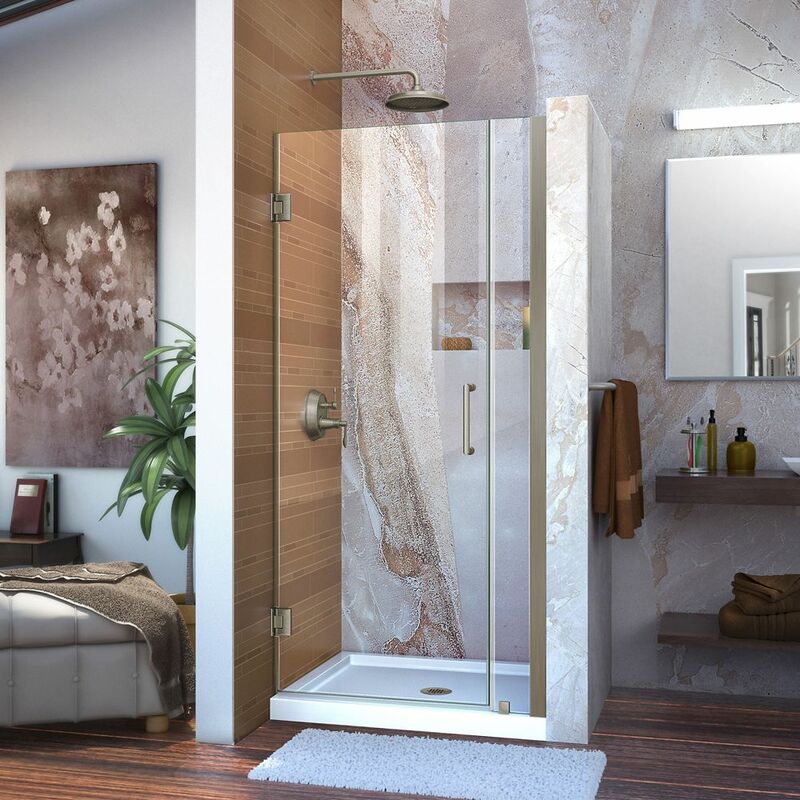 Complete your bathroom with the elegant and innovative look of the Flex shower door and SlimLine base kit from DreamLine for the complete solution for your shower project. Unidoor 35-36 inch W x 72 inch H Frameless Shower Door in Brushed Nickel is rated 4.7 out of 5 by 6. Rated 5 out of 5 by happyshoweruser from We've had our shower door installed for about a month now and I'm very happy with it! It looks be... We've had our shower door installed for about a month now and I'm very happy with it! It looks beautiful, the weight of it is heavy so that it feels luxurious, the water runs off of it nicely, and the water is contained within the shower. Rated 5 out of 5 by Buff from Nice quality, installation went smoothly. ... Nice quality, installation went smoothly. Rated 5 out of 5 by TedB from Great looking door I wanted a framelse's door and this one is great. I installed it myself with a little help from my wife. Installation was no problem. Looks great. Rated 5 out of 5 by hannahL from Take my advice!!! Let me start my saying that my bathroom remodel has been filled with problems! My contractor, while a nice person, measured incorrectly and we ordered the wrong sized door. Take my advice! Wait until your tile is up before you measure for any glass shower door! I was heartbroken that the door didn't fit. Luckily I purchased it locally and after about 20 minutes talking to a DreamLine customer service rep, I ordered a door that they assured me would fit perfectly....and it did! The best part of the whole remodel was walking in and seeing that shower door in place! Rated 3 out of 5 by ebjs from Good quality Lousy directions Directions made things more difficult because they applied to more than one model.. There were extra parts because they applied to more than one model..Screwing hinges in to wall was tricky because one of the screws on top hinge is impeded and will scratch inside hinge.. Their solution is to carefully remove the inside plate of hinge attached to door. I almost lost the door by doing that procedure..Next, removing shim beneath door was a chore. Try removing a 5/8 piece of wood from bsottom of door and shower curb after heavy glass door was resting on while hinges were screwed to wall . Last part of directions said to make sure the stationary piece of glass is even with top of door. Can't be done unless you remove bottom hinge and shim the hinge at the wall. I just left it alone..If anyone notices a 1/4 difference between the two pieces of glass, they can make the adjustment.